Welcome to Fuerteventura Villa Pax! This beautiful renovated 5 star villa is on one of the best seafront locations in Corralejo with spectacular ocean views of the islands of Lanzarote and Los Lobos and direct access to a wonderful beach. Walk to the right along a lovely coastal walk to the famous dunes or stroll to the quaint harbour and relax in one of the little restaurants. You don't need a car - it is all on the doorstep. With only a five minute walk to 4 grocery stores, many restaurants and the main street of Corralejo and , it is ideally situated for all to enjoy (and yet it's still quiet at night). Fuerteventura Villa Pax is on two levels and is finished to a very high standard. Fuerteventura Villa Pax is fully renovated and very well maintained with new kitchen, bathrooms with large walk in showers, spacious lounge, TV room and very high quality beds with memory foam mattresses that together with the gentle sound of the waves at night make for good nights sleep. Fuerteventura Villa Pax has everything one could hope for to make for the most memorable of vacations. - Cancellation policy: Full refunds (minus bank charges and commissions) if another party books the previously reserved time. -Parking available on street outside of complex. - Maximum accommodation is 6 people, including children. We are a family that really likes water sports and had been looking for a place to escape the wet, dark, cold northern European climate and when we came to Fuerteventura we just fell in love with the place. 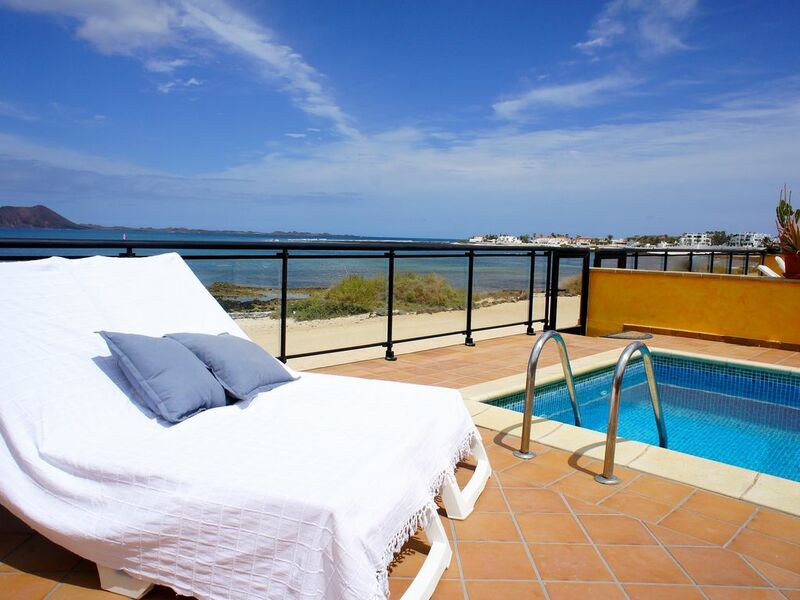 The villa is on the beach with great views of Lobos Island and Lanzarote. Surfing, windsurfing, SUP boarding and snorkling are right out the door. The villa is convenient to all the shops and restaurants but is also very quiet. It is just a 30 minute drive from the airport and we have a wonderful couple who look after the villa for us and keep it spotless. The interior is newly renovated and the beds and views are just great! - Bathroom 1 is adjacent to bedroom number 1 and has large walk- in shower and wc. - Bathroom 2. has large walk-in shower, bath, and wc and is across from bedrooms 2,3 and 4. - Separate wc in bedroom 2. No dedicated parking place, but it is rare to have to walk more than 50m from parking space on the street outside of the complex. Living/dining room has TV, DVD, coffee table and 2 sofas. Dining area has table and chairs in dark wood. WIFI. There are about 20 english language TV stations. Kitchen re-modeled in Dec 2014, has new oven, induction hob, new fridge/freezer, granite work surfaces, full size dishwasher . It is fully equipped with everything you will need. Indoor table has chairs for 6. Outdoor table has chairs for 6. About 20 English language chanels on TV in Lounge. There is a DVD player upstairs in the lounge and downstairs in the TV room. The pool area has potted plants and dining table, sunbeds, sofa group. Very nice sunloungers (not plastic). The pool area has a gate to prevent access by small children. Salt water pool. The nearest golf course is 10 minutes drive. The property was amazing, right on the beach. Fantastic views!! The house was brilliant, large, bright and airy. A spacious modern kitchen with everything we needed. The bathrooms were really large and spacious with modern walk in showers. Mark and Janne, the owners, gave us all the information we needed for a great hassle free holiday. They were very helpful throughout the whole booking process and right up until the end of our holiday. We will definitely go back and book with them again. The outside area consisted of a nice pool and plenty of seating area to chill or enjoy a bbq. Another great plus, we could just walk out of the gate and straight onto the beach. The house is in a quiet area but just a short stroll to the centre so is in a great location. This Villa is every bit as good as the description with a layout and facilities that are truly exceptional. The beds too are to a very high standard which was a real bonus. Everything was well maintained and the owner who was very helpful throughout clearly takes a pride in achieving such a high standard. The pool was at a very comfortable temperature and sitting there taking in the breath-taking views out to sea was without doubt the true experience of relaxation. The villa is in a very quiet location but only a short walk to the local supermarket, shops and restaurants . We hired a car for the week from "Goldcar" at a very reasonable rate but it was mainly used as a taxi to and from the airport. This was because the Villa and its surroundings offered so much we preferred to make the most of it rather than travelling about in a car! I would recommend this Villa without any hesitation or reservation. Our group of 5 stayed here for 6 days and enjoyed everything the villa, Corralejo and the fantastic weather could offer. Everything far exceeded our expectations. Not only did the villa have everything you could ever need + a brilliant heated pool but - being able to exit the rear gate directly onto the beach and paddling and snorkelling in the sea just topped it off. Our 12 year old asked if we could just go home without her!! The views across to Lobos Island and watching the ferries from Lanzarotte come and go, and watching the windsurfers at play meant that there was always something to be entertained by when lounging at the poolside. This being our first time in Corralejo we were amazed by the number of shops within a very short walking distance - ranging from supermarkets, the usual tourist gift shops, to high end fashion and jewellery boutiques and we have never seen so many and so varied restaurants within such a relatively small area. Back to the wind and rain until next time.. This villa is in such a good location that I think it would be hard to beat! Beautiful outlook towards Lanzarote and the harbour, close enough to the centre of town to walk to whatever restaurants/shops/bars you want but within a quiet residential complex where you could truly relax and unwind. The beach outside was never crowded and we really enjoyed watching the comings and goings of people just stopping for a dip or a quick snorkel, surfers/paddle boarders or those people just walking past on their way to town. The kids loved having access directly to the beach and it was wonderful being able to let them come and go whilst being able to keep an eye on them from the comfort of the sunlounger. The villa itself is great - very clean, well maintained and had everything that we could possibly need. Really spacious and found it very quiet at night with loads of seating outside in the shade or our of shade and good quality, solid furniture. Mark and Janne were excellent to communicate with and got in touch whilst we were there to check that all was well. Gonzalo was very helpful and keeps the place (and some others around) really spick and span. Would absolutely recommend this villa to anyone wanting a laid back holiday but with easy access to a bit of life if you want it - no car really necessary but plenty of parking around if you do hire one! We will be coming back for sure! We stayed at Mark and Janne's villa in April- location on the beach is stunning and catches the sun all day. Villa is beautiful- fresh, modern, immaculate and benefits from a quiet location, albeit only a short walk into town. We'll definitely return! The villa is situated on the beach front, with panoramic views of Isla de los Lobos and Lanzarote. The beach runs for several miles from the quaint harbour to the famous dunes. Supermarkets, restaurants and banks are a 5 minute walk from the villa. You don't need a car - it is all on the doorstep. The nearest golf course is 10 minutes drive and the nearest airport, in Puerto del Rosario, the capital of Fuerteventura, is a 30 minute drive away. The villa is situated in a very sought after location with good restaurants and shops within walking distance. The harbour has a variety of excellent excursions, fishing, submarine and catamaran sailing. Kite surfing and wind surfing schools are on hand.